The past two weeks I have been working on terrain, and for two months or so before that I have (at irregular intervals) been researching and planning this work. 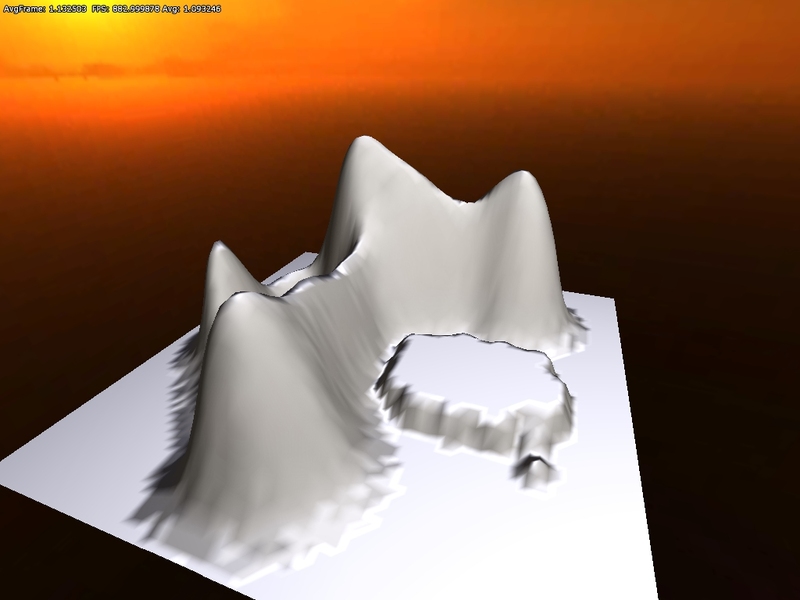 Now finally the geometry-generation part of the terrain code is as good as completed. The first thing I had to decide was what kind of technique to use. There are tons of ways to deal with terrain and a lot of papers/literature on it. I have some ideas on what the super secret project will need in terms of terrain, but still wanted to to keep it as open as possible so that the tech I made now would not become unusable later on. Because of this I needed to use something that felt customizable and scalable, and be able to fit the needs that might arise in the future. What I decided on was a an updated version of geomipmapping. My main resources was the original paper from 2000 (found here) and the terrain paper for the Frostbite Engine that power Battlefield: Bad Company (see presentation here). Basically, the approach works by having a heightmap of the terrain and then generate all geometry on the GPU. This limits the game to Shader Model 3 cards (for NVIDIA at least, ATI only has it in Shader model 4 cards in OpenGL) as the height map texture needs to be accessed in the vertex shader. This means fewer cards will be able to play the game, but since we will not release until 2 years or so from now that should not be much of a problem. 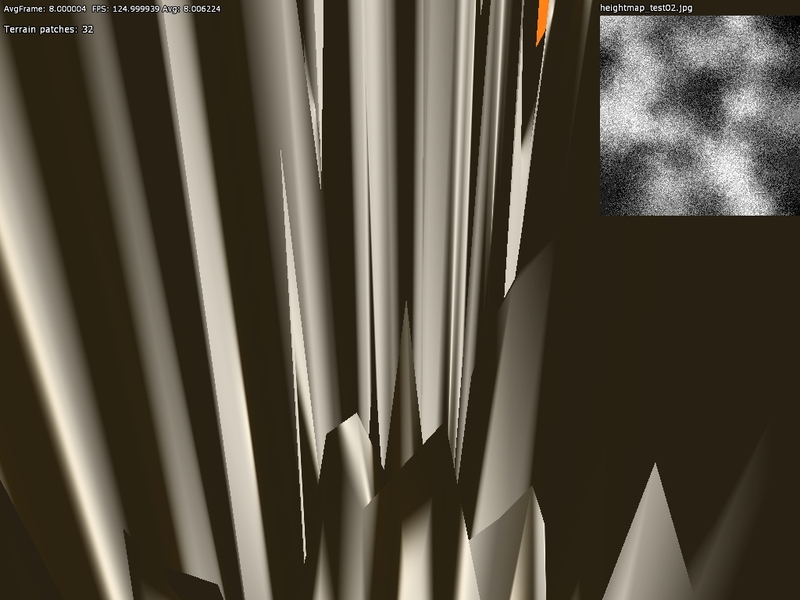 Also, it would be possible to add a version that precomputes the geometry if it was really needed. 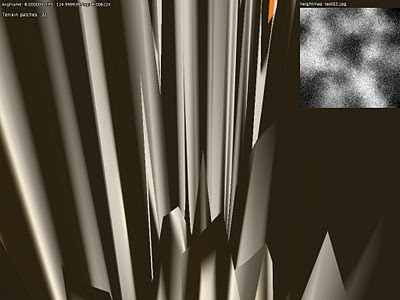 I save the heightmap in a normalized form, which means all values are between 1-0, and max_height is what each value is multiplied with when calculating the vertex y-value. The unitsize variable is what a texel represent in world space. Note that here are some bumpy surfaces at the base the hills. The is because of precision issues in the heightmap I was using (only used 8bits in the first tests) and is something I will get back to. The basic algorithm is pretty simple and is basically that the longer a part of the terrain is from the camera, the less vertices are used the render it. This works by having a single grid mesh, called patch, that is drawn many times, each time reperesenting a different part of the terrain. 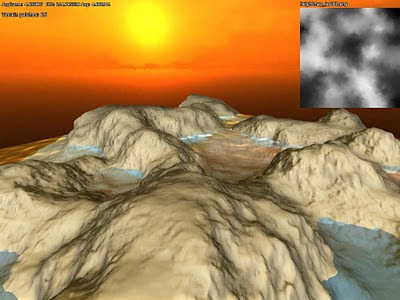 When a terrain patch is near the camera, there is a 1:1 vertex-to-texel coverage ratio, meaning that the grid covers a small part of the terrain in the highest possible resolution. Then as patches gets further away, the ratio gets smaller, and and grid covers a greater area but fewer vertices. So for really far away parts of the environment the ratio might be something like 1:128. The idea is that because the part is so far off the details are not visible anyway and each ratio can be a called a LOD-level. The way this works internally is that a quadtree represent different the different LOD-levels. The engine then traverse this tree and if a node is found beyond a certain distance from the camera then it is picked. The lowest level nodes, with the smallest vertex-to-pixel ratio, are always picked if no other parent node meet the distance requirement. In this fashion the world is built up each frame. While there are 16 border permutations in total, only 9 are needed because of how the patches are generated from the quadtree. The same vertex buffer is used for all of these types of patches, and only the index buffer is changed, saving some storage and speeding up rendering a bit (no switch of vertex buffer needed). The problem is now that there must be a maximum of 1 in level difference between patches. To make sure of this the distance checked, which I talked about earlier, needs to take this into account. This distance is calculated by taking the minimum distance from the previous level (0 for lowest ratio) and add the diagonal of the AABB (where height is max height) from the previous level. The sky texture is not very fitting. But I think this shows that the algorithm worked quite well. Also note that I did no tweaking of the LOD-level distances or patch size, so it just changes LOD level as soon as possible and probably renders more polygons because of the patch size. There is a few bits left to fix on the geometry. For example, there is some popping when changing LOD levels and this might be lessened by using a gradual change instead. I first want to see how this looks in game though before getting into that. 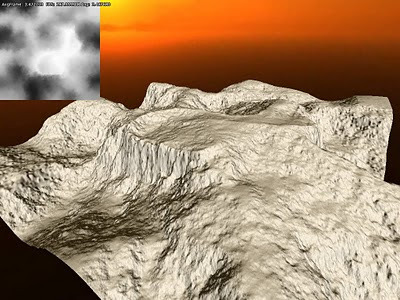 Some pre-processing could also be used to mark patches of terrain that never need the LOD with highest detail and so on. Using hardware tesselation would also be interesting to try out and it should help add surfaces much smoother when close up. These are things I will try later on though as right now the focus is to get all the basics working. Next up will be some procedural content generation using perlin noise and that kind stuff! Take a look at http://vertexasylum.com/2010/07/11/oh-no-another-terrain-rendering-paper/. Combine his algorithm with instancing and you will have a very nice solution. I love hearing about tech stuff, keep it coming. b = fraction(g)*256 is correct! Fixed so it says. Thanks for pointing out! Just missing the shadows, which I think will need to be done in a different way. I think the gentle slopes of terrain will lead to too much flickering issues (due to the nature of normal shadow mapping). 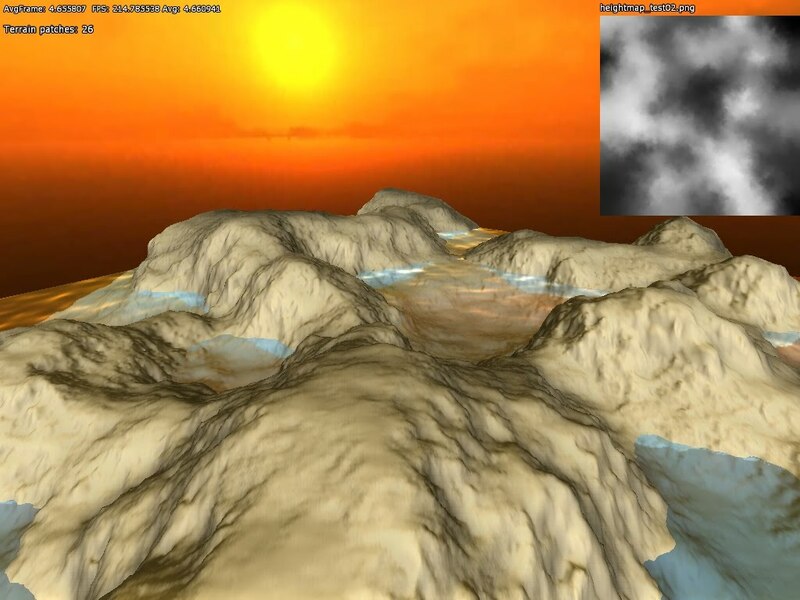 So perhaps gonna use exponential shadow maps or similar for the terrain. I know that Crysis use different shadows for terrain hills, but then they also use forward rendering so not sure how to fit that in. And not even sure shadows for terrain will be needed for the game. only really needed if there are very steep slopes and/or a low sun (or sun-like source of directional light). I'm really not a tech head (the arty-farty writing and design stuff is more my area :P) but it's great to see you're working on improving external areas. I noted a lot of people, in the wake of Amnesia, were asking for more journeys beyond the castle walls. I guess you guys noticed too. A Frictional Games project taking place outside? In the sunlight? What is this madness?! Anyways, take your time, and good luck with whatever it is you're working on. Have you considered listening to some atmospheric music to boost your imagination when creating a game ? 214 frames per second. Ouch. 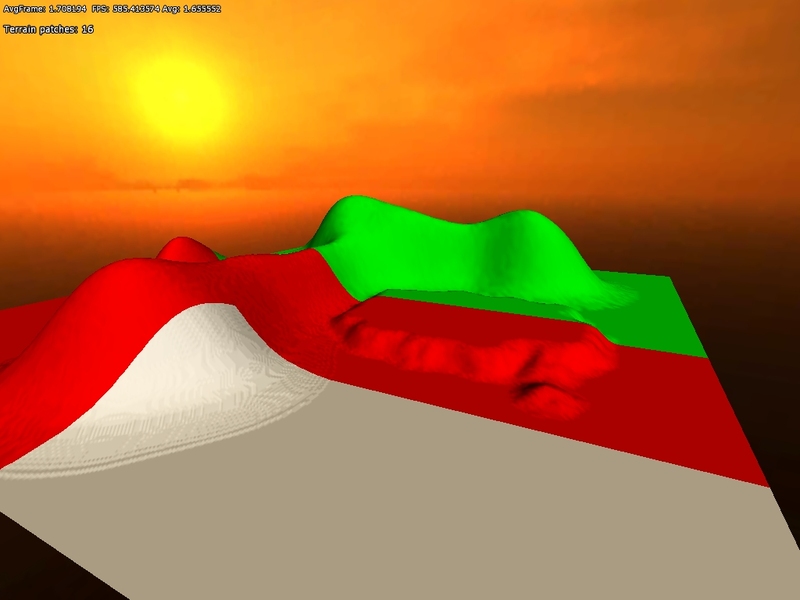 I've done a Terrain engine for the iPhone 3G (not 3GS) using OpenGL ES 1.1 (see Desert Combat http://www.zenyes.com/), and I get 60fps with terrain features and geometry (I've obviously hit the vsync limit, so I could draw more). On my desktop PC with vsync off, I was getting 2600 fps (yes, over two thousand). The secret was using plain old triangle fans, not triangles, since triangles gave only 1300 fps. I couldn't believe the difference either. There are other speed hacks as well. 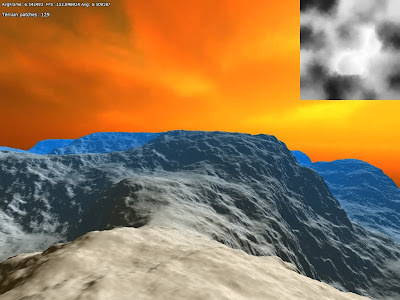 The terrain is mirrored, so that when the helicopter reaches the game world bounds, there is still terrain drawn in the distance, just mirrored. You really have to look for it to see it, otherwise during game play, you wont. So effectively from a 4x4km game world, I've got at 12x12km game world. Sweet. I was thinking of tri fans when I started out, but did not wanna go for it since it seemed to make the edge geometry extra annoying to create. Hearing that you had great success with it I will probably give it a try!